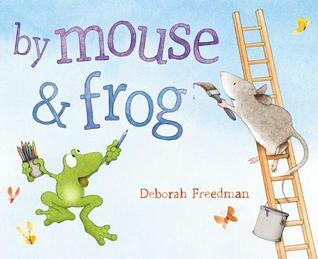 Deborah Freedman is the author and illustrator of several books for children, including BLUE CHICKEN and THE STORY OF FISH & SNAIL. Her newest book is BY MOUSE & FROG, the story of two young writers who also like to read… a lot. You can learn more about Deborah at DEBORAH FREEDMAN author & illustrator. ❤ this! I look forward to reading the book. So I write books for kids. And I read hundreds, thousands, millions. So how do I join? Or have I already? Love, love, love reading these “friends” sharing their excitement about reading, writing and The Nerdy Book Club!!! Looking forward to meeting you in person next week at my school!